The famous Rose Cup Races return to Portland International Raceway (PIR) on July 7 – 9. The BMW CCA will once again take part in this great race weekend with our BMW Corral located right alongside the front straightway. We invite all BMW owners, member or not, to join us for this festive weekend. Watching race cars close up battle for first place is a thrilling experience. If you have been to this event before then I am sure you have your own personal favorites to watch. Whether it is the Big Bore ground pounders or the Spec Miata race cars, there is a race for you to enjoy. Since we are the BMW club we find a special love for the Pro3 Race. These are BMW’s known as E-30’s, or better known as BMW 325i’s from the years 1984 to 1991. This is also a spec race group, meaning there are limits set to the type of modifications that are allowed. All cars generally have the same horse power. This makes for a very competitive race. These are not slow cars, and the drivers wring every bit of available horse power out of them for a very exciting race. 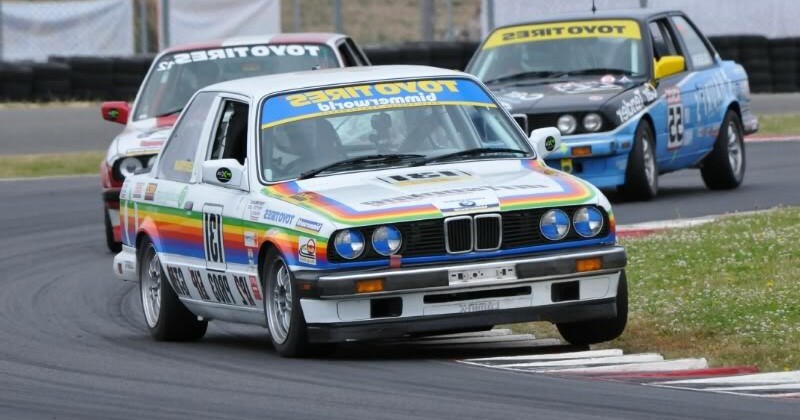 To join the BMW corral and participate in the parade ride on the track, buy your Car Corral pass directly from the Rose Cup website at https://impactflow.com/event/3002/checkout/tickets Scroll the menu down to “Car Corral” (last menu selection). The cost is $40 for all three days. This includes the Car Corral pass with two people per car. Additional daily passes can be purchased to have additional people in the car when you drive in. When you arrive, drive in the front gate and present your passes. Then follow the signs to the Car Corral area. You will see our BMW canopy, chapter flags, and rows of BMW’s. We hope to see you there!